In a polar molecule, there are two poles present in the molecule.Hence, the molecule is said to possess an electric dipole.Since the molecule as a whole is electrically neutral ,the negative charges is always equal in magnitude to the positive charge. The product of magnitude of negative or positive charge(q) and the distance between the centres of the positive and negative charges is called dipole moment. It is usually donated by µ. The charge q is of the order of 10-10 esu and the internuclear distance d is of the order of 10-8 cm. Therefore ,the dipole moment is of order 10 -18 esu cm. Dipole moment is a vector quantity i.e. it has magnitude as well as direction. As a polar diatomic molecule possesses only one polar bond, the dipole moment of that molecule is equal to the dipole moment of the polar Bond. In HCl, the molecular dipole moment is equal to the dipole moment of H-Cl bond i.e 1.07 D.
As a polyatomic molecule has more than one polar bond ,the dipole moment is equal to the resultant dipole moment of all the individual bonds. The magnitude of resultant dipole moment not only depends upon the values of the individual dipole moment of the bonds but also on their arrangement in space. Dipole moment of water is 1.84 D which is equal to the resultant dipole moment of two O-H bonds. In case of ammonia ,the dipole moment of molecule i.e. 1.47 D is the resultant of the dipole moment of the individual dipole moments of N-H bonds. In carbon dioxide molecule, there are two polar bonds. These polar bonds possesses the same value of dipole moment but the overall dipole moment of molecule is found to be zero. Individual dipole moment in this molecule are of equal magnitude but their directions are opposite to each and hence cancel out. In symmetrical molecules like Boron trifluoride ( BF3) Methane ( CH4) and carbon tetrachloride (CCl4), the molecular dipole moment is found to be zero. Individual dipole moments cancel out on account of the symmetry of the molecule. In BF3 ,the resultant of two bond moments being equal and opposite to that of the third cancel out. CHCl3 is also tetrahedral but has a dipole moment of 1.04. Both NH3 and NF3 molecules have pyramidal shape with one lone pair of electrons on N atom. As fluorine is highly electronegative, it appears that N-F bond should be more polar and the net dipole moment of NF3 should be much greater than that of NH3. The dipole formed between the lone pair and nitrogen atom has to be taken into consideration which is in the direction of the lone pair. F is more electronegative than nitrogen ,therefore direction of bond is from nitrogen to fluorine whereas nitrogen is more electronegative than hydrogen, the direction of bond is from hydrogen to nitrogen. 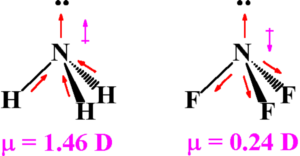 Resultant moment of N-H bond adds up to the bone moment of the lone pair, that of 3 N-F bonds partly cancel the resultant of the lone pair.Hence the net dipole moment of NF3 is less than that of NH3. 1) In determining the polarity of bonds : Greater is the magnitude of dipole moment, higher will be the polarity of the bond.This is applicable to molecules containing only one polar bond.In case of non-polar molecules like H2 , O2, N2 etc, the dipole moment is found to be zero .This is because there is no charge separation in these molecules. If any molecule possesses two or more polar bonds ,it will not be symmetrical if it possesses some molecular dipole moment. If a molecule contains a number of similar atoms linked to the central atom and the overall dipole moment of the molecule is found to be zero ,this will imply that the molecule is symmetrical. Cis isomer usually has higher dipole moment than trans isomer. The dipole moment of para isomer is zero and that of ortho is greater than that of meta.